Stay Curious is a collection inspired by the children's song "The Bear Went Over the Mountain." Like the bear in the song, we have all felt the desire to explore and find out what's on the the other side of the mountain. 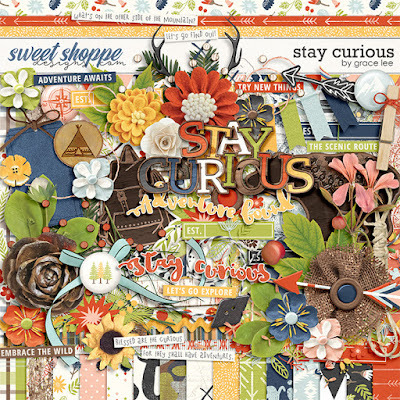 "Stay Curious" embraces and celebrates the wild, adventurous spirit. With lots of natural elements, inspiring quotes and woodsy accents, this collection is incredibly versatile and can be used to document hiking, camping and all other outdoor adventures. 74 elements. The elements included are: 1 antlers, 2 arrows, 1 banner, 1 berries, 2 borders, 1 bow, 3 branches, 4 buttons, 1 clip, 3 flairs, 11 flowers, 2 floral stickers, 1 frame, 2 grass, 5 labels, 3 foliage, 3 paint, 2 ribbons, 1 ric rac, 1 rope, 3 scatters, 3 stamps, 2 strings, 1 tag, 2 wood veneer, 9 word art, 2 wood pieces, and 2 wreaths.